Top cupcakes with decorative flowers. Learning to make some of the most commonly used flowers for decorating is a skill that pays off. Flowers are a beautiful topper for virtually any cake, from birthday cakes to retirement cakes to congratulatory cakes to wedding cakes. Frosting flowers are a delicious way to add decorations to any cake. Making them out of buttercream icing, fondant or gum paste takes a lot of practice. However, there are plenty of options for making flowers for decorators of any skill level. Along with learning flowers, decorators should also learn how to make flower leaves and stems. This is an important skill when making realistic versions of blossoms and spray toppers. Drop flowers are usually one of the first flowers decorators learn to make, and are adaptable to almost any cake worthy occasion. They are simple and only require easy buttercream frosting and the right tip. To make a drop flower with large petals, pipe icing slowly while twisting your wrist to the right. Add a small round dot to the center of the flower to complete it. Every decorator has his or her own variations on each of the roses listed above. Rather than trying to perfect someone else's method, consider learning several ways to make roses and choose the one you like the best as your signature rose. 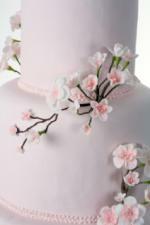 Apple and cherry blossoms are delicate flowers frequently used on wedding cakes and anniversary cakes. These blossoms are commonly made using gum paste, though you can make fondant flower blossoms and buttercream blossoms, too. Daisies are a trendy flower for decorating birthday and wedding cakes. The daisy comes in both soft colors and bright, bold colors, making them versatile in a number of cake designs. A buttercream or fondant daisy is a perfect summer cake decoration idea. Top cupcakes with large versions the cover the entire frosted surface for a stunning display. Sunflowers are another flower becoming popular in cake decorating. They can be piped directly onto a cake or made using a flower nail with buttercream or royal icing. Sunflowers add cheer into any cake design. Many fall cake designs incorporate sunflowers, from autumn harvest cakes to fall wedding cakes. Poinsettias are commonly used on Christmas cakes or Yule logs in December. Red poppies are a symbol that honors veterans and are fitting for patriotic cakes on Memorial Day or Veteran's Day. Carnations in red, white and blue are perfect 4th of July cake decorating ideas or as an alternative to roses on Valentine's Day cakes. Calla lily gum paste and fondant flowers, while rising in popularity for wedding cakes, are a traditional Easter flower that will look beautiful on a spring cake. Although they are not flowers in the traditional sense, learning to make four-leaf clovers is a handy skill for decorators to have as St. Patrick's Day draws near. Although many skilled decorators can craft a beautiful flower in their kitchen, the appeal of fresh flowers has not waned. Fresh flowers are likely to remain one of the most commonly used flowers for decorating for many years to come. They are often used on large tiered wedding or anniversary cakes. Hydrangeas, roses and lilies are all frequently used flowers. 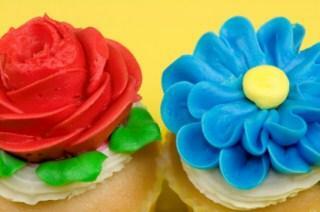 Purchase specialty cake decorating supplies to keep flowers from touching the cake. Certain varieties of fresh flowers can be candied or sugared. This makes them edible cake toppers, although not everyone will eat them. Just make sure the flower chosen is considered safe for human consumption before adding to a cake. The list of commonly used flowers for decorating is one that changes with every decorator, as everyone has a favorite flower or technique. The best way to learn how to make flowers is to practice until the skill is flawless.